Our completely renovated condo offers spectacular finishes with granite counters, stainless steel appliances, flat screen TV's, wood burning fireplace and much more. Our condo is four miles away from the biggest (and best) downhill skiing in the west and a few minutes from Big Sky town center. The living area is an open space concept with a fully equipped kitchen to make a gourmet meal, dining area seating 8 people, granite breakfast bar, and cozy living room featuring the wood burning stone fireplace. There are two bedrooms featuring queen size beds and a bunk room with 3 twin beds and 1 full bed. The master bedroom has a flat screen TV, large closet and sitting area. The top floor bath has a tub with shower, the remaining two baths have large showers. There is a one car garage with tuning bench. Washer and dryer in unit and a recreation center with pool and hot tub nearby. I can't say enough about how beautiful this condo is. The remodeling that was done with the slate and ceramic tile, granite counters and woodwork is just incredible. This condo has everything you need for a a cozy place whether summer or winter. 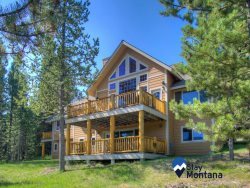 We used it as our home base for hiking and visits to Yellowstone, Paradise Valley, and Bozeman as well as the surrounding area of Big Sky. There is no wifi, so you have to count on your cell service. If you have At&t, it's not the greatest reception, so be prepared to be a little "disconnected" from the world. (Not such a bad thing on vacation, right?) The pool and hot tub were nice, too. No A/C. Most places don't have it around here. It cools off nicely during the night and there's good cross ventilation with the windows open. You may even hear the packs of coyotes off in the distance at night. I heard them on two nights during our stay. There is a washer and dryer, too, which was a nice convenience. Overall, the place was wonderful and we'd highly recommend it. Thanks for allowing us to stay in your beautiful place and enjoy the area.